MIS Accounts Payable — Accu-Tech, Inc. The MIS Accounts Payable system is a comprehensive module that allows for the logging, tracking and reporting of your payables, while helping to manage cash requirements and disbursements. 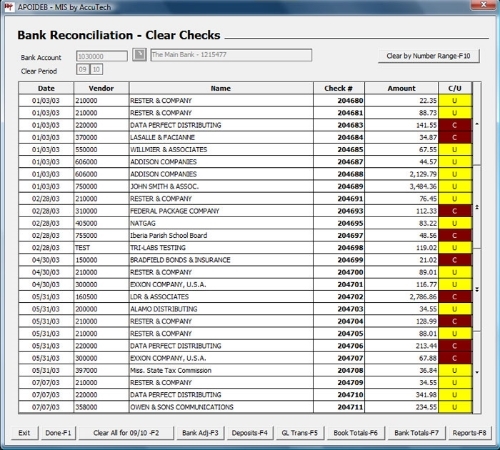 The system integrates with the MIS General Ledger and Purchase Order modules. Some of the information contained in the vendor file includes: Address and contact information, standard due date controls, standard discount date controls, standard terms discount controls, default general ledger controls, vendor classification, payment cycle controls, purchasing goals, extended information for contract terms and conditions, and more. The Vendor Ordering file is used to maintain discount schedules/levels and is used in conjunction with the Purchase Manager function to assist in optimizing your ordering process. Invoices/Vouchers can be input in a live or batch mode. Vendor look-up windows provide easy access to the vendor account. The system will automatically calculate the due date, discount date and discount amount, based upon the vendor profile. Invoices can be associated with a purchase order in order to track and monitor unrecorded liabilities, under receipts, over receipts and cost discrepancies. The system allows for account adjustments and credits, along with due date and discount date changes. You may also void checks from current and previous periods. Several features are available for controlling which invoices will be paid and when. Selection/Exclusion of payment can be based upon vendor, due date, invoice number, discount date, due date and vendor, payment cycle, promise date, dollar amount, and others. Various cash requirements reports are available to assist you with cash flow planning. The system also features immediate/demand check printing, manual checks, bank reconciliation and multiple bank accounts. The bank reconciliation function includes deposits, checks from Accounts Payable, checks from Payroll, and any journals affecting the cash account from transactions entered directly through the General Ledger.